The Dyn Pick is a capacitive force sensor that can detect forces (Fx, Fy, Fz, Mx, My, and Mz) in six directions simultaneously. Assuming various applications, this WEF-6A200-4-ECP has a waterproof and dustproof structure (IP65) as a standard. Also, this 6-axis force sensor, operating on PoE, incorporates WACOH-TECH’s original stopper mechanism as a measure against overload and amplifier box, which would be indispensable for conventional strain gauge type force sensors, and also includes Ethernet ( TCP/IP ) communication. 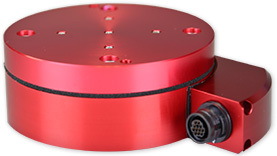 This 6-axis force sensor with greatly improved reliability is suitable for diverse processes, such as force control of industrial robots, pressing force control, grinding, deburring, and assembly work. Force control of industrial robots, precision fitting, deburring, pressing force inspection, grinding work, etc. Machining control of machine tools, etc. *Specifications are tentative and subject to change. *A dedicated cable is separately required. Copyright © WACOH-TECH Inc. All rights reserved.